Last night I went to Verdun to visit with some friends. I planned to check out the area west of Desmarchais and east of Stephens before going home hoping to find some stuff left out the night before. 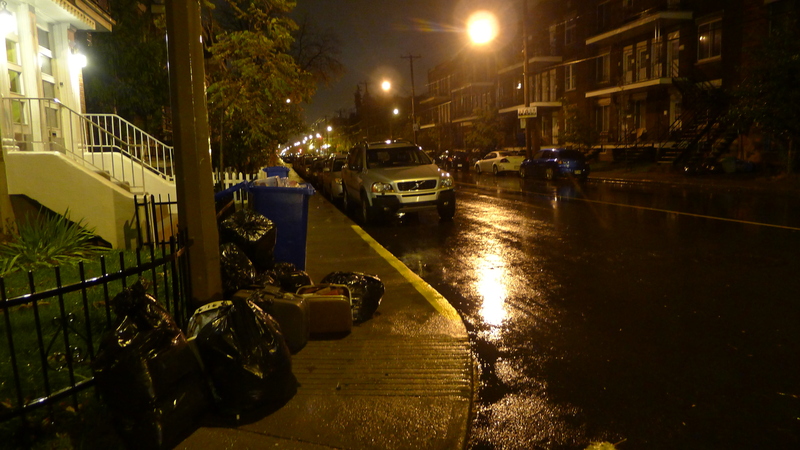 Unfortunately it was a pretty rainy night and while I toured around a little bit there wasn’t much on the curb – people tend to wait until the morning to bring out the trash when the weather is bad. 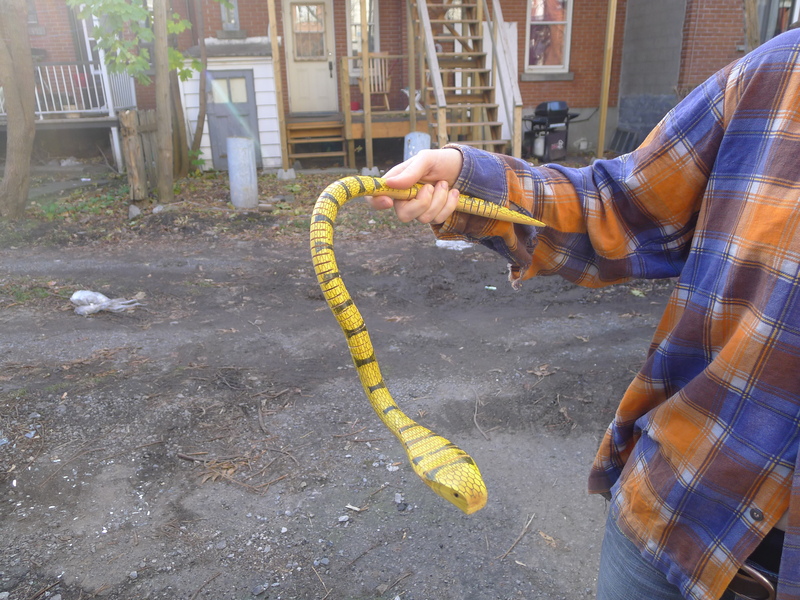 I managed to find a few cool things, though, in this trash left out somewhere on Bannantyne. Inside the suitcases were a couple of small bags containing some pins and a bit of jewellery. These are the pieces that stuck out. 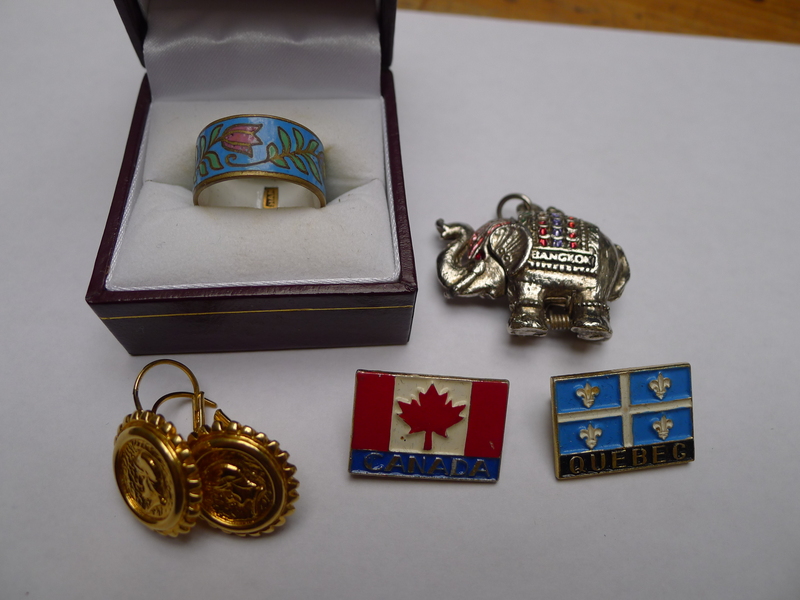 The ring at the top is marked “Siam” and the little elephant pendant / locket is from Bangkok. Whoever owned these probably went on vacation to Thailand at some point. The ring is quite nice, good yard sale material. 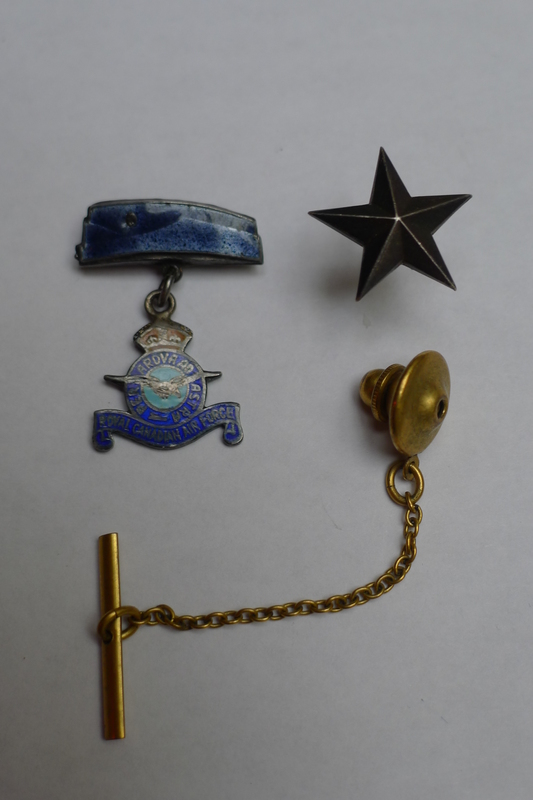 The best piece, however, was the last one I pulled out of the bag – an old Royal Canadian Air Force pin. It featured the motto “per ardua ad astra” (“through adversity to the stars”) and is made of sterling silver. I’m not sure exactly how old this is and couldn’t find anything quite like it online. However, I’d guess that it would have been made sometime in the 40s, perhaps during WWII but perhaps after as well. It’s in great condition, complete with really beautiful enamelling. I thought the star pin might have been military as well but I can’t be sure. There’s no mark but I’d guess that the star is made of silver. As usual, any information about these pieces would be appreciated! Otherwise, there hasn’t been a plethora of good trash in recent days. My haul from TMR was relatively modest. 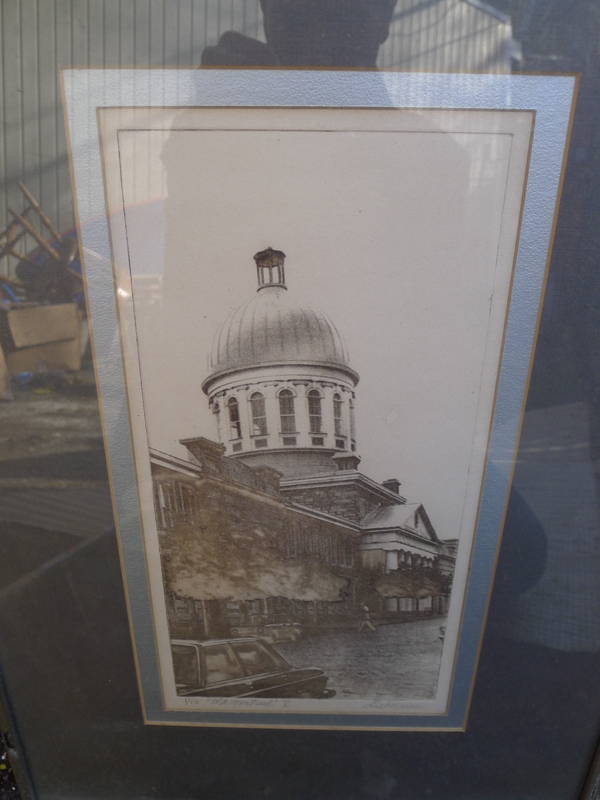 I found some nice art though, including this piece entitled “Old Montreal” by an artist named Lieberman. It looks to be a “shopped” photo. Apparently it was part of a series, the piece is also marked 1/10. It’s either that or there are were only ten copies made. Based on the cars in the picture it was probably made in the 70s or 80s. I also found this painting by a “J Rose.” It’s a pretty nice piece, at least from my admittedly amateur perspective. Here’s a few other odds and ends from my Wednesday morning trip to TMR. 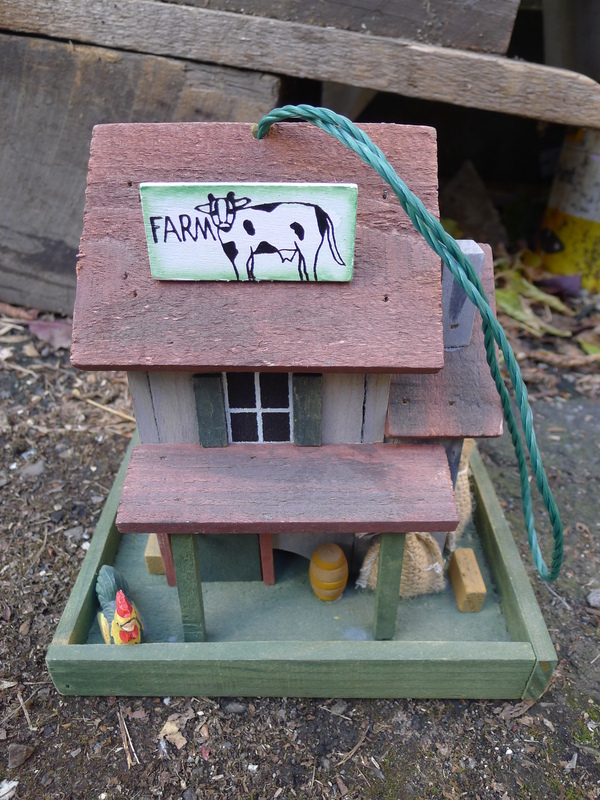 This is a perfectly good birdhouse! One of those all-in-one game sets. I don’t think it had ever been opened. 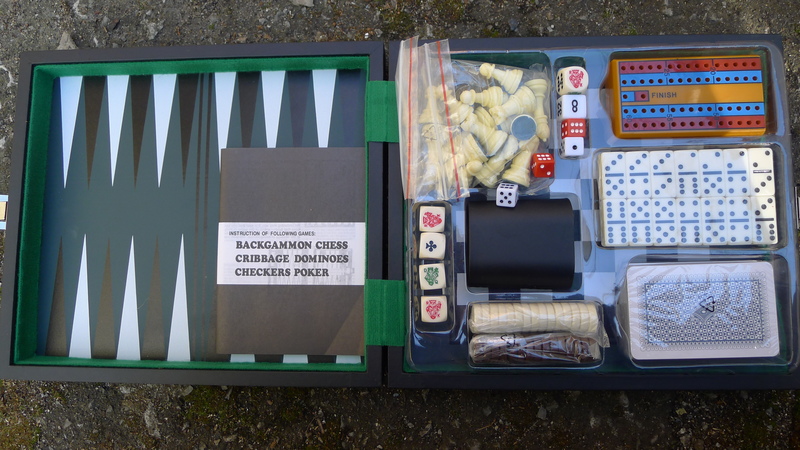 It was in its original box and all the pieces are still wrapped. 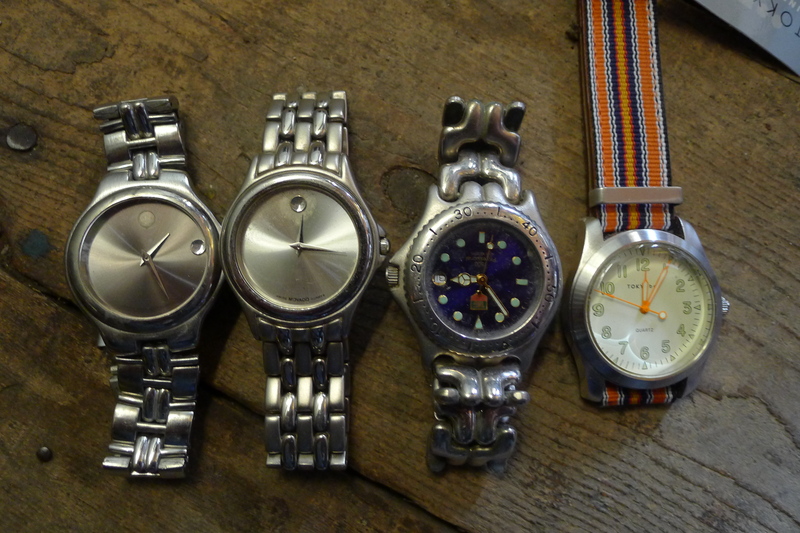 …and also a few Quartz watches. They probably just need some new batteries, though the one on the left also needs a little glue for the fallen 12 o’clock dot. A few knick-knacky things. 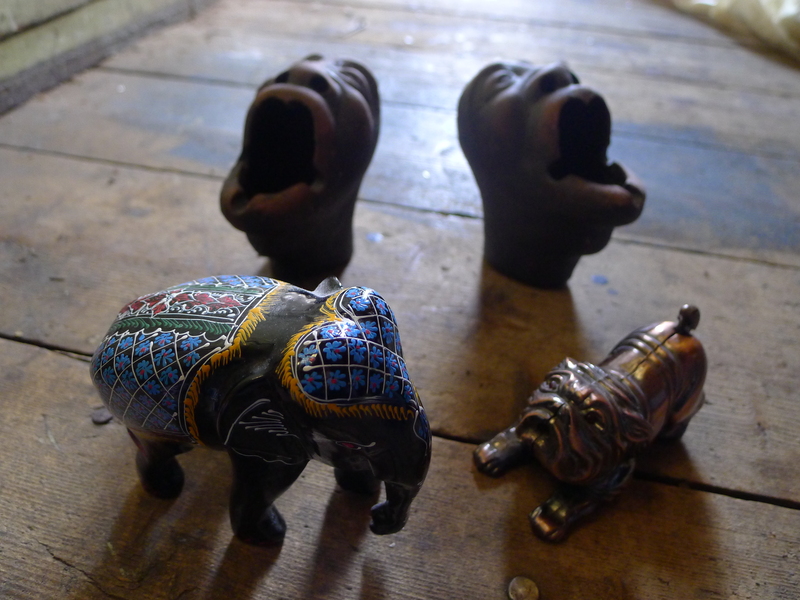 The dog is a lighter, elephant is an elephant, and the open-mouthed figures in the back are Cuban-made ashtrays. Last for today is this cool wall hanging I found in Rosemont last Thursday. It was in a bag amongst a bunch of renovation materials. I think it’s an old “chalkware” piece as it appears to be made of plaster. Chalkware was popular from the late 18th century to the early 20th century but also during the great depression due to it being extremely cheap to produce. 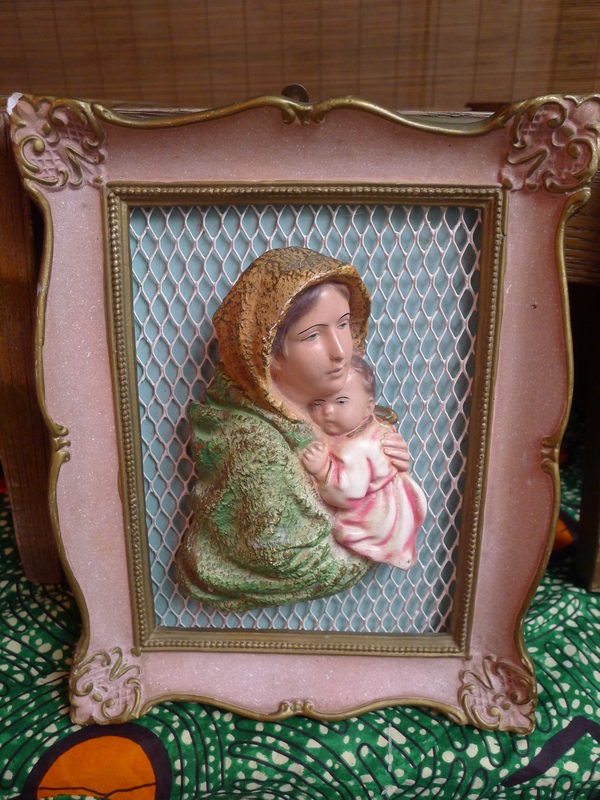 It features an image of the Madonna, a very popular image in chalkware art (in addition to other Christian symbols). I imagine this hanging would have been during the depression years. Outside of a chip on the top left corner (and around the hanger, though no one would ever see it) this piece is in great condition. Chalkware is quite fragile so for this piece to be in this good of shape is pretty remarkable. I doubt it’s worth a tonne, but I wouldn’t be surprised if I could get around 20$ or so. I’ll probably head out to Rosemont later this evening, seeing as I slept in this morning. Hopefully I’ll have better luck there than I’ve had recently. I luv your site and look forward to it all the time..
you are really finding some cool stuff..
Très intéressant à suivre comme blog. Les trouvailles sont passionnantes. Bravo. wow… you sure did well. nothing familiar to me, however, i have heard on antique shows, many times, that chalkware can be quite valuable. seem to recal it tended to be easily damaged, so, although much of it appears cheap, it is still valuable. is there any printing on back or anywhere of plaque?..if there is cloth on back, maybe peel it back carefully to see under it? I suppose it’s the odd case where something old is actually sort of flimsy but still collectible. A lot of old stuff was made solid, but chalkware might be the pasts’ equivalent to today’s “made in China” plastic. I was so happy to read about your garbage outing in western Verdun.Yes,it was rainy.But you still found a few gems on Bannantyne street.I know it is far,but please go to western Verdun more often.Next time,go to Verdun West early in the morning. You find lots of paintings,posters,etc in the trash every month.I know a large number of alumnum cans and beer bottles do get rescued from the trash and recycling bins and a number of guys scavenge scrap metal,but if you were not there,how many of these paintings,posters and insignia would get rescued?I hope other occasional scavengers rescue valuable art and knick–knacks and pop culture memorabilia from the trash before the garbage truck comes.Do you meet such art scavengers on your rounds from time to time? 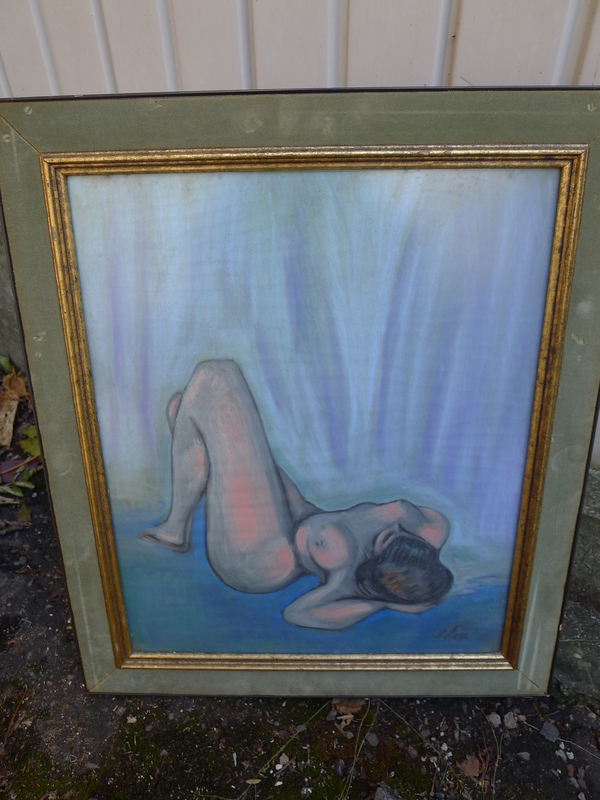 Larger paintings or stuff that is right out on the curb is often, but not necessarily picked up by casual or opportunistic trash pickers. It depends on whether they see personal value in saving the item. A lot of people don’t understand the value, that’s why it’s being thrown out in the first place. Can collectors and scrap metal collectors don’t generally pick up art, it just weighs them down and makes what they’re doing more difficult.